Duncan has captured the timeless, iridescent beauty of everyone’s favorite gemstone and transformed it into a translucent overglaze, ideal for adding that classic luster to your pieces! Don’t let water and other solvents get the best of your projects! Capture the essence of good brush and tool hygiene with Essence – the must-have solution for cleaning all of your brushes and tools used with overglazes. 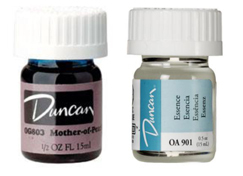 Essence is the perfect accessory to working with Duncan overglazes; other cleaning agents may contain water or solvents, resulting in the separation of overglaze during subsequent applications. Use a separate bottle of Essence for each overglaze product.